If you have multiple email domains in your Office 365 tenant and those email domains are spread across two or more Yammer networks, consolidating into one Yammer network will be required as of October 16, 2018. This article is only necessary if you have multiple Yammer networks, for example if your company has multiple business units or subsidiaries, each with its own Yammer network. Consolidation to one primary network helps get all your employees closely collaborating with each other, and simplifies management of your Yammer network. Identify the Yammer networks to consolidate, identify data to export and upload, plan any needed changes to group structure and membership in the primary network, and plan communication with your users. IMPORTANT: Migration only migrates users, not content. Export all content from secondary Yammer networks that you might want to access later, as there won't be any way to access the content otherwise. No-one can access the secondary network after the migration begins. Use the sample communication below to let everyone on the secondary networks know the purpose of the change, the timing, what information will be kept, and the group structure in the primary network. Recommend that users save information they want to keep before the migration start date, such as files and data in conversations. Let primary network users know that more people are joining. Run the network migration tool once for each secondary network. The tool migrates all users from the secondary Yammer network into the primary Yammer network, and turns off the secondary network. It does not migrate any conversations or files. Adjust the structure of your primary Yammer network so it meets the needs of users who will be joining it. Create groups, invite members to the groups, and upload files that you exported. Let everyone know the consolidated Yammer network is ready to use. For more information, see FAQ: Consolidating multiple Yammer networks. During the migration, only active and pending users, including the users' information, such as name and profile picture, are migrated. If a user exists in a primary and secondary network, the user's account in the primary network will remain and if needed, will be promoted from a guest account to a regular account. The account in the secondary network will be deleted. Groups, conversations, and files are not migrated. If you want any of this content from your secondary network, you must export it and upload it. After a migration completes, no-one can access the secondary Yammer network.- Only users with the global admin role in Office 365 can perform network consolidation. 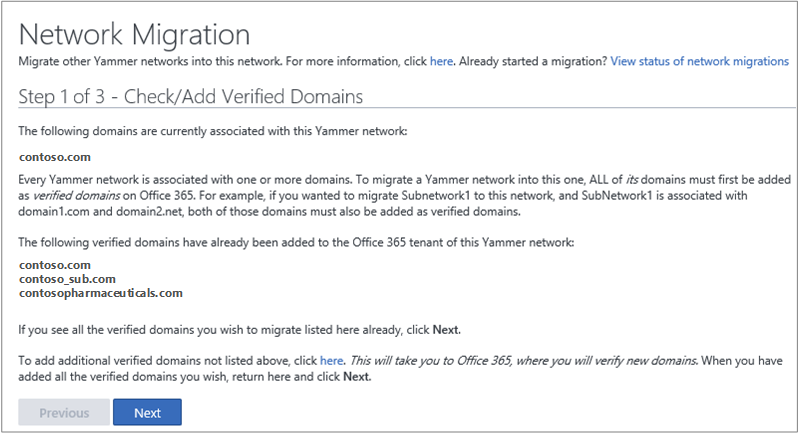 The primary and secondary Yammer networks must be on verified domains in one Office 365 tenant. Consolidating Yammer networks across Office 365 tenants is not supported. The secondary networks can be either Yammer Basic or Yammer Enterprise, but the primary network must be Yammer Enterprise. Network migration can't be reversed. Multiple network migrations can be started back-to-back, without waiting for the previous ones to finish. Which Yammer networks need to be consolidated? Which network should be the primary network, and which are the secondaries? What role should users have in planning the consolidation? Consider using a Yammer group on each secondary network to help plan the changes. What's the timing? Do we need down-time? If so, what's the best time to schedule this? What's the best way to communicate with the users before and after the consolidation? What groups are necessary in the primary network for the users who are coming in from the secondary networks? Who should be in these groups? Who should be the admins for each group? For each secondary network, what content needs to be exported and loaded onto the primary network? Who will do each task: export the data from the secondary network, set up the group structure in the primary network, decide what data needs to be uploaded, upload that data, and communicate with users? Do you have the resources in-house to do this, or do you need a third-party to help? When you export data from a secondary network, you'll end up with CSV files containing group, user, admin, file, and conversation information, plus a folder that includes all the files from the network. Identify who can help you upload data. Someone from your secondary network will need to identify content that is important going forward and map it to where it needs to go in the parent network. Once you determine what content is important, identify the skillset required to bring the content into your primary network. If there is a small amount of data, it can be done manually. But if you have a lot of content in the secondary network, you will need someone comfortable using Windows PowerShell and the Yammer API. You may need to find a third-party to help you. If you need to create new groups with specific people from the secondary network, or adding users from your secondary network to existing groups in your primary network, for each group, you'll need to create .csv files with the group members to invite. If you have just a few groups to add or modify, you can create these lists before migration (see Create a .csv file with emails for a group), and then for each group, invite members from your primary network after migration. If you have many groups, you'll need a person who can use PowerShell and the Yammer API to generate the group membership changes from your secondary network before migration, and to set up the groups in your parent network. If you want to load files or messages from the secondary network, you'll need a person who can use Windows PowerShell and the Yammer API to write scripts to load the data. For information about how to export all Yammer data for a secondary network, see Export data from Yammer Enterprise and Export data from Yammer Basic. Exported files can be uploaded to the primary network. You'll need to create a mapping between the file name and the location for the file in your primary network. Group names and group memberships are not migrated. You can use the exported lists of groups and users to help you create appropriate groups in the primary network. Conversations are not migrated, so secondary network users must save any needed data from conversations. To communicate with all users on a network, you can use the Yammer All Company group, or, to contact people by email, for Yammer Enterprise, you can export the Yammer users list. For instructions, see Export data from Yammer Enterprise. For Yammer Basic, there is not a way to get all email addresses. In both Yammer Enterprise and Yammer Basic, you can get all email addresses in a specific group. For instructions, see Export Yammer group members to a .csv file. [Contoso.com] is consolidating all our Yammer networks so that we can all communicate more easily with each other. We will start this migration on [date]. When the migration is complete, when you access Yammer using your regular work email address, you will go directly to the new consolidated Yammer network. The consolidation does not move your Yammer content from [Contoso_sub1.com] to the [Contoso.com] Yammer network. You must save any files and conversations you want to keep. In Yammer, click the Settings icon, and then click Files. Use the My Files section to find your files. Next to each file you want to save, click the down arrow, and then click Download. Choose a location, and then click Save. In Yammer, click your Inbox, and then click Private Messages. Click a message and review the content of the conversation, and copy and paste any needed information into a file. Please do not use the [Contoso.com] Yammer network from [date] to [date]. We'll be adding groups and group files from the [Contoso.sub] network. You'll get another email from us when everything is ready to use. We're excited to announce that all of [Contoso] users from [Contoso_sub1] and [Contsoso_sub2] will now be joining us on the [Contoso.com] Yammer network. Questions or concerns or just want to welcome [Contoso_sub1] and [Contoso_sub2] staff? Join the new "One company - one Yammer network" group. We want your input to make our new consolidated network help everyone's voice be heard. Before you start, be sure you have exported data from the secondary networks and communicated with users! The network migration has three steps that you will be guided through. 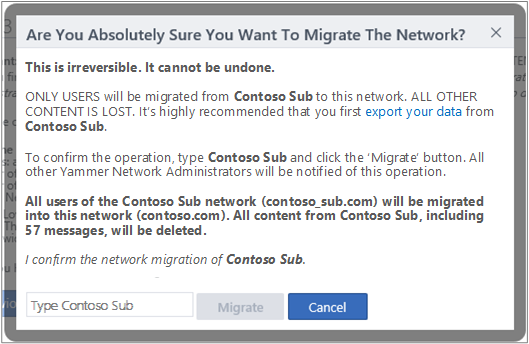 Multiple network migrations can be started back-to-back, without waiting for the previous ones to finish. Start from the primary network (the network into which you want to migrate the other networks). In the primary Yammer network, go to Settings > Network Admin. You start on the page with the title Step 1 of 3 - Check/Add Verified Domains. This page lists the verified domains that have already been added to the Office 365 tenant for this Yammer network. If you don't see the network you want, follow the link to Office 365 to add additional verified domains, and then return to this page. When you have added all of the verified domains you want, choose Next. You are now on the Step 2 of 3 - Choose a Yammer Network to Migrate page. This page lists all the networks that are eligible for migration. Remember, all of the domains of a Yammer network that you want to migrate must be added as verified domains on Office 365. Only the verified domains for Yammer networks are listed on the page. If you don't see the network you're looking for, choose the Previous button and add the verified domains. 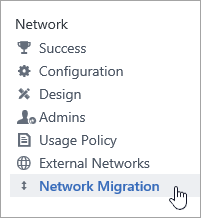 On the Step 2 of 3 - Choose a Yammer Network to Migrate page, select the secondary Yammer network that you want to migrate into this network, and then choose Next. You reach the page with title Step 3 of 3 - Export Data & Start Migration. This page gives you information about the network you are about to migrate, such as network name and number of messages, so that you can confirm if it is the right network. Note that only active and pending users will be migrated. All other content is permanently deleted. When you have exported the data you want, and you are ready to begin the migration, choose Start Migration. In the Are you absolutely sure you want to migrate the network? box, under I confirm the network migration of Network Name, enter the name of the network you want to migrate to confirm it, and then choose Migrate. You cannot stop or reverse the migration. So be very sure that you have exported all of the data that you want and that you have chosen the correct network to migrate before you choose Migrate. If you are unsure, choose Cancel and go back to export your data or check the network name. Please note, once you migrate a network, all content and data in the secondary network will be lost. Make sure to export any files or documents you wish to keep before initiating the migration. On the Status of network migrations page, you can view the status for the migration. It lists the domains associated with the networks being migrated, the person who initiated the migration, the start and completed dates and times for the migration, and the status of the migration. You can see details about the network, such as the number of active users, the number of messages, and the external networks. Note that multiple network migrations can be started back-to-back, without waiting for the previous ones to finish. So, you can start the next migration immediately by going through the wizard again. 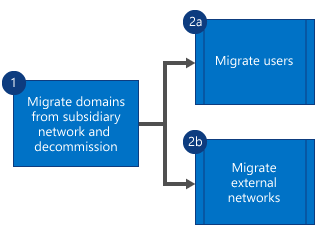 The network migration process works as shown in the following illustration. In step 1, the domains from the secondary network are migrated and the secondary network is decommissioned. Then in step 2, the active and pending users and external networks are migrated in parallel. Even if a subset of users or external networks is not migrated, the migration itself will continue and finish, and more details/errors can be found on the status page. The migration status page can show the following error messages. The migration of the secondary network did not succeed. If one or more users failed to migrate, there will be one or more error messages to that effect. At this point, you can decide to add the user manually to the primary network. Note that the secondary network has been migrated at this point. If one or more external networks failed to migrate, there will be one or more error messages to that effect. Note that the secondary network has been migrated at this point. To troubleshoot further, contact Yammer support. Use the data from groups.csv and users.csv to identify groups that might be needed in the primary network, and to invite the new users to those groups. You can do this manually or by creating a Windows PowerShell script. In data exports, files are named with their Yammer ID, rather than their file name. Their file name and location is listed in the Files.csv file, so you will need to create a Windows PowerShell script to rename the exported files and load them into the appropriate location in the primary network. Use this communication to reinforce how you want people to use Yammer. We're ready to start collaborating more efficiently! Please sign in to Yammer today, using your [Contoso.com] email and regular password for that account. If you need your password reset for that account, please contact [IT department]. We've restructured the groups so that the content works for everyone, so please take some time to browse the groups and join the ones that make sense for you. Questions or concerns? Join the new "One company - one Yammer network" group. We want your input to make our new consolidated network help your voice be heard.